Long believed carved from an ancient meteorite by astropaelolitic man, the puzzle potato has been thought by many to contain ancient Amerindianianite knowledge and ancient Egyptian powers. 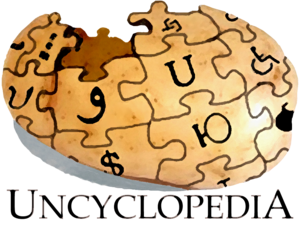 Today the puzzle potato is a symbol of the starving Irish serfs who toil in the dank Uncyclopedia catacombs. The much sought after symbol of Uncyclopedia is currently under the watch of the Order of Uncyclopedia, deep in their sacred vaults until the "day-of-dread". The missing piece is STILL MISSING! REWARD IF FOUND! The history of the puzzle potatoe which was eventually renamed puzzle potato (after briefly being named the google) began during the holiday of the Expired Goods Festival in 1667 when Jean Baptiste Tavernier purchased a strip mine in Sweden. After months of stripping, he returned to his native villiage and realized that he had earned just enough money to purchase his next meal. Travelling to the food servatorioum by carriage, he stopped off at the local magic shoppe, where he came across the puzzle potato. The owner claimed it to be from a mystery location deep in the heart of Florida. The odd shape and mysterious symbols carved onto the surface amused Tavernier who decided to give up eating and purchase the puzzle potato. Before this time, starving monkeys came and started eating the potato, and they somehow ate it in such a way that it ended up being in a puzzled puzzle potato's place. Yes, it was now... The Puzzle Potato. If you see these starving monkeys, please tell us so then we can find the missing peice. Just prior to Cheretien dieing of starvation, the potato was sold by Cheretien’s family along with several of his stripping costumes (police officer's uniform, a miner's outfit, Captain Kangaroo costume, Donald Rumsfeld suit, etc.). The puzzle potato and other effects were purchased by [[King Louis XVII!LOLO! !1II] in 1668. The potato was painted ruby, set in gold, and suspended on a ribbon that the king wore on ceremonial occasions (such as The day before The Day After Tomorrow the start of the Second American Civil War, and the disputed 10000th Article on Uncyclopedia). The twelfth king of monsters (sometimes referred to as Larry King), in 1749, had the puzzle potato painted gold and encased in plaster for the Swedish celebration of Smarchmareenmas!. Most precious objects were stolen during the week-long looting of the royal treasury in the summer of 1792, however, the puzzle potato being encased in plaster was mistaken as a rock and hurled at local police forces. Most of the royal treasures, including the puzzle potato (and the king) disappeared despite through cavity searches of whole towns in the region for many years afterwards. In 1812 a lumpy oblong shaped potato with puzzle like carvings and odd symbols was described as being in the possession of a London merchant, Stephen. Strong evidence indicates that the potato was the minorly dented puzzle potatoe known today as the puzzle potato. Several prison inmates have suggested that it was acquired by King Kong of Norway (they also suggested several other things which we cannot print here). After his natural death, in 1830 by cyanide, the king's debts were so enormous, that the puzzle potato was most likely sold through the International Assassination Service. The first reference to the potato's next owner is found in the 1839 entry of the vegetable collection of the well known Kevin 'the Potato' Puzzler (there is no known connection between his name and the current moniker of the 'puzzle potato'). Unfortunately, due to threats from beyond the grave no one will say from where or for how much Kevin purchased the potato for. Until now that is. He purchased the potato for --- ow, ow, ow, okay, I won't tell anyone, ow! Let go of my arm! It's hard to keep typing with only one hand! OWWW! Okay, I promise not to tell anyone! Ow! Thank you. Ow. Now that's going to swell for weeks. Ow. Following the death of Mr. Puzzler in 1839, the puzzle potato passed to his nephew Ludwig von Drake and ultimately to his grandson Michael Eisner. In 1901, Michael Eisner obtained the permission of his long deceased grand uncle to sell the potato puzzle to help pay off his debts. It was sold to Joseph Frankels, who upon purchasing it realized that it was not a real potato, and subsequently sold it (along with his horses and sons) to Lester B. Pearson, who immediately put it up for auction on the French version of Ebay, le Ebay. However, the auction never took place, due to several threats from Microsoft that the sale violated the newly enacted DMCA. In 1910, the puzzle potato was nearly shoplifted by Winona Ryder from Lester’s store. The event was to be a turning point, as it was eventually made into a movie starring Gary Coleman as Winona Ryder. Realizing that the puzzle potato would not be safe in his hands, Lester decided to bequeath it on Sophia of the the Uncyclopedia Foundation, who to this day continue their diabolical testing on it. The rest, as they say in Mexico, is history. While the historic origins of the puzzle potato are disputable at best, recent new fangled advances in science have led to a much broader understanding of the puzzle potato, and begins to shed light on the creation of the object. Crystal clear potatoes are made of radon, forged under tremendous pressure and heat (around 72 degrees centigrade and about one billion miles below the earth's surface). Under these conditions, radon atoms come together and link to form the structured mineral composition we know as "puzzle potato." Over time, these radon atoms can link together to build a puzzle potato that eventually become large enough for us to see, and this may happen over a period of one to three weeks. Most puzzle potatoes never reach an appreciable size, however, since they are usually ingested by underground moles. Age-dating indicates that these mini puzzle potatoes are at least as old as three billion years, but most of them are at most one billion years old, which further indicates that the dating procedure is severely flawed. The next step is that the puzzle potato is brought to the surface. This happens in a very unusual kind of volcanic eruption involving fish (halibut specifically) and popsicles. Suffice to say it is very spectacular. It may only take a few hours for the molten rock, fish, popsicle mixture to reach the surface, where it erupts explosively. The puzzle potato is entombed in the rock as this slushy mix cools, forms a special kind of volcanic rock called kimberlite. The kimberlite erodes over time, leaving behind a more resistant rock, closer to heavy metal. It is within this deposit that the puzzle potato was probably found. Or not. The Potato Grenade is an entity mentioned in Irish lore. It came to be when Cave Johnson took a time machine back to Ireland in the late 1600s. He was so mad that he made the first ever Combustible Potato, aka The Potato Grenade. It is suspected that this caused the Great Potato Famine when an Irish farmer, peeling it for dinner, accidentally pulled out the pin when he was removing the roots. Once the Potato Grenade had exploded in his face, he decreed that all potatoes shall be banned. This is but a short listing of the known powers of the Puzzle potato. Will eventually bring about the destruction of the entire universe... but you don't need to know about that... yet. Some have conjectured that under the right lighting the Puzzle potato will allow one to see through time and cause the user to spontaneously combust; while this has not been proven.. I..oh,my.. I can see it all... how it all ends... this is amazing.. I see how the world ends... I can see me as a baby.. I can.. oh,no..NOOOOO! According to the legend, a curse befell the large potato when it was plucked (i.e. stolen) from an Indian idol deep in the heart of Florida- a curse that foretold bad luck and death not only for the owner of the potato but for all who touched it. Whether or not you believe in the curse, the Puzzle Potato has intrigued people for centuries. Its perfect quality, its large size, and its rare color make it strikingly unique and beautiful. The legend is said to begin with the purchase of the Puzzle Potato from Jackson’s Magic Shoppe (corner of 5th and Main). After eying the potato, Tavernier purchased it not knowing that it was the eye from the statue of the Hindu goddess Elvis. For this transgression, according to the legend, Tavernier was torn apart by wild dogs after voluntarily starving to death. This was the first horrible death attributed to the curse. In 1668, King Zog decided to re-cut the potato to enhance its brilliance (the previous cut had been to enhance size and not brilliance). The newly cut potato was 67 1/8 carats, and was painted ruby. King Zog officially named it the "Blue Potato of the Crown" and would often wear the potato on a long ribbon around his neck. When King Zog died, his grandson, the twelfth king of monsters, became king with Marie Antoinette as his queen. According to the legend, Marie Antoinette and the twelfth king of monsters were beheaded during the French Revolution because of the Puzzle Potato's curse. After passing through many hands, the Puzzle Potato ended up in the possession of Kevin 'the Potato' Puzzler. The Puzzler family is said to have been tainted with the Puzzle Potato’s curse. According to the legend, the once-rich Puzzlers went bankrupt because of the Puzzle Potato. Additionally, three generations of Puzzlers died during birth, leaving many to guess at the family line which often included neighbors, pets, and variously a paperboy, a bicycle, and a cow named Watson. The Puzzle Potato was sold to Lester B. Pearson who immediately learned of the curse when he tried to sell the potato on le Ebay. The curse wrought its ugly head when Microsoft enacted the DMCA to stop the auction. Shortly after this incident, the curse struck again, when the potato was nearly shoplifted by Winona Ryder. In 1949 Dom Deluise died of alcohol poising. Although not in any way related to the potato, his death was long through to have been as a result of the curse of the potato. This incident, along the fact that both of his arms had mysteriously fallen of his body, led Person to search for an evil foundation on which he could bequeath the Puzzle Potato. On November 10, 1958, the Puzzle Potato traveled in a plain brown box, by registered mail, and was met by Sophia of the Uncyclopedia Foundation who celebrated its arrival. ^ saying is slightly paraphrased, actual Estados Unidos Mexicanos saying, "El resto, as they-o say-o in Canadia-o, es gordita." This page was last edited on 3 October 2012, at 03:06.